I’ve read the above prayer several times in order to get a “feel” for where I should go with it and each time I find myself “tripping” over two words wait and patience. 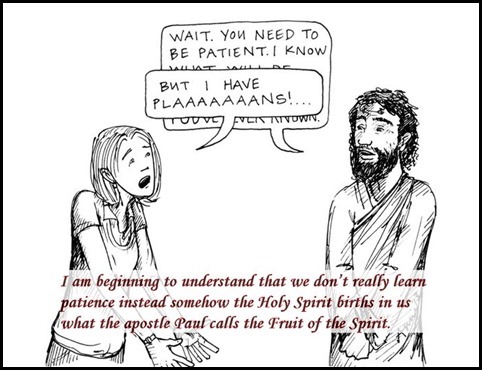 Not because I am impatient but as ex-impatient person it reminds me of our continuing need for patience and the experiences that have nurtured the patience the Holy Spirit has birthed in me. I became a lifelong student of Patience University (affectionately known as Ole PU) in the mid 1980’s when for the first time I underwent hip replacement surgery which turns out not only slowed my walking pace but as a “divine fringe benefit” (blessing) slowed the pace of my life down as well. Not only did the surgery itself teach me patience but all the years my surgeon spent in training to did as well. However, the greatest lesson in patience struck me this morning as I thought of Jesus’ birth and all the “silent” years and the transition from Jesus the son of Joseph the carpenter to Jesus the Son of God at his baptism by John. One last thought… I’ve been an Ole PU dropout a couple of times and it ain’t pretty! My advice is stay in school!